To be quite honest I have tried to start the season a couple of time over the past couple of months. Was signed up for a half marathon that I never got to train for because of some pain. I was dealing with and then was going to kick things off in grand style last weekend at the MS150 which got partially rained out. Talking to my coach a couple weeks ago he suggested I do some more races this year in an effort to increase the fun factor and with two local races this weekend I had my pick. 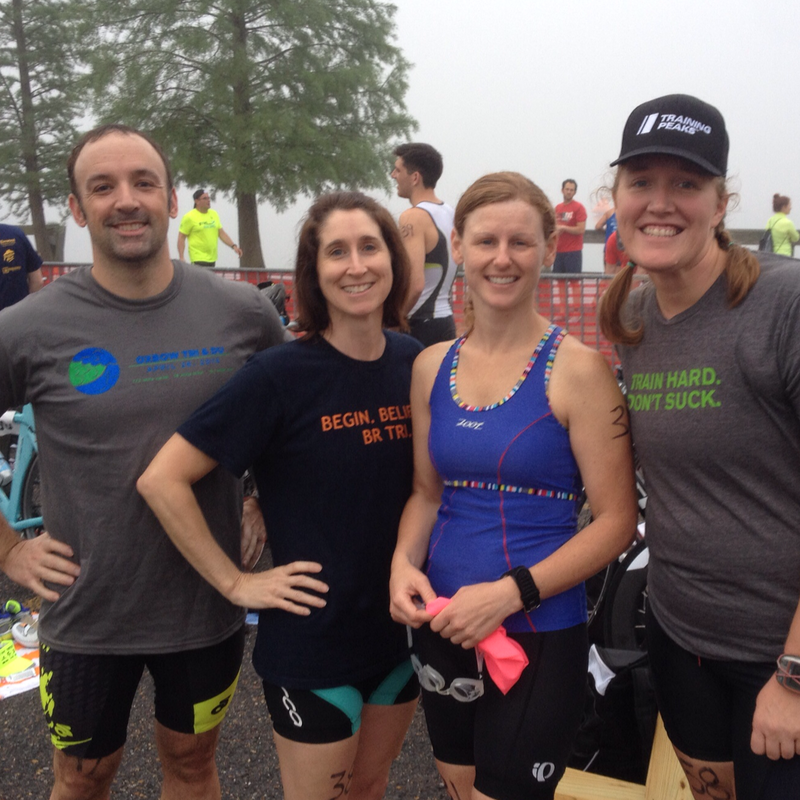 Even though the other race this weekend was very close to my heart (read more about why here) I decided to go with the open water option that was a bit longer, too. I have done this race a couple times before my surgery, so thought it would be interesting to compare those results (2013) to my post surgery attempt. Driving over there was so much fog. I could hardly see the other cars on the road and could barely tell I was on the bridge crossing the river. I wondering how this would impact the race but knew it would eventually burn off as the forecast was calling for a high of 90 degrees. But the fog ended up not being a factor and even kept the course a little cooler for a bit longer than usual. The swim was wetsuit legal–woohoo! And I was one of only a handful that had brought theirs so you better believe I wore it. I did what I normally do and swam fast out of the gate just to get my own space in the water and around the first turn I settled into a good pace that I kept for most of the rest of the swim. It was a two loop swim which was nice so I got to catch up with some of the guys in the wave before us. Swam up the boat dock until I could plant my hand on the ground to help me stand up in the water as I am much more weary of my footing post surgery. Was the 3rd woman out of the water and into T1. Wetsuit off. Bike shoes, helmet, race belt on and then me on the bike and off I went. There’s a hill to climb just outside of transition and since my bike really likes to stay in my granny gear I was all set to go. I know my bike fitness is not where I want it to be because of the latest bout of pain but I wanted to see where I was. I tried to spin most of the first half of the bike course trying to keep my cadence up and not wreck my legs. After I hit the turnaround I kicked it up a notch and gave a stronger effort–not sure if that really was the case because I cannot find my garmin and therefore had no real data other than the time and percirved effort, but I felt like I was pushing more. It’s a very flat course and little wind so it’s all about how well the engine works. And the engine could have used a little more work before the race. Back at T2. Racked bike. Changed shoes. Off on the run. And guess what? I ran it! I decided I would not listen to my mind and my lungs but would listen to my knee about when to stop and walk…and my knee kept silent so I kept running. I did walk thru the aid stations and at the turnaround and maybe for 30 seconds more at one other point but there was a whole lot of running going on and that made my entire race! Post race there was some limping and lots of ice but overall I’m pretty happy with how everything is recovering today. And tomorrow begins another week of training. I am glad I listened to my coach and got out to race this weekend. The race course really is one of my happy places. This year has been much harder to find the motivation to spite the setbacks, but racing this weekend has helped to stoke the fire a bit. Thus begins the 2015 race season! 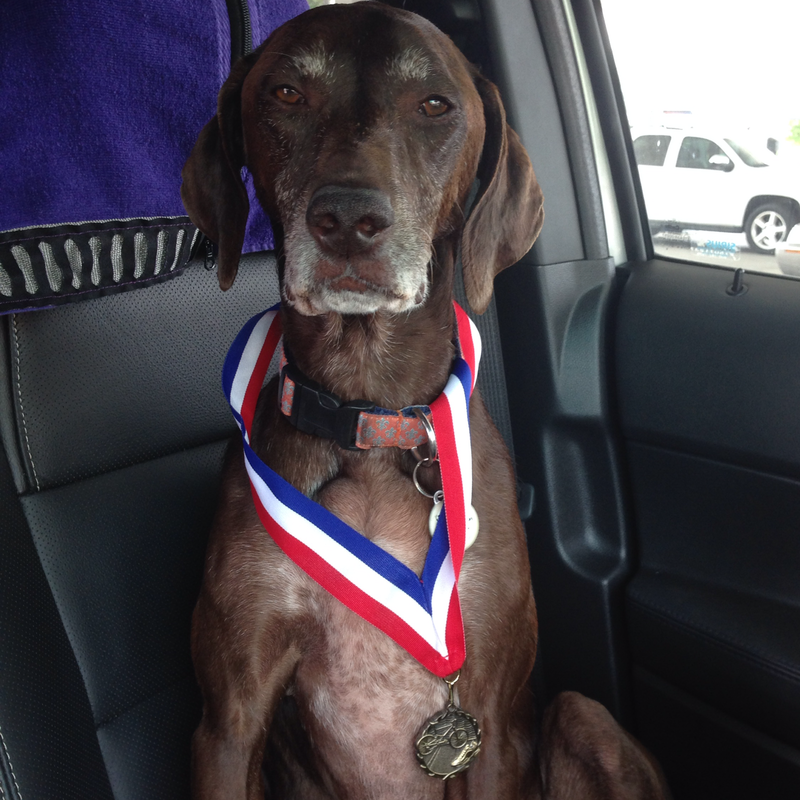 Annie participating in Medal Monday with my finisher’s medal!